Geologic time spans 4.6 billion years, from the early Earth through present day. That's a lot of time to cram into a brain evolved to deal with the day-to-day. 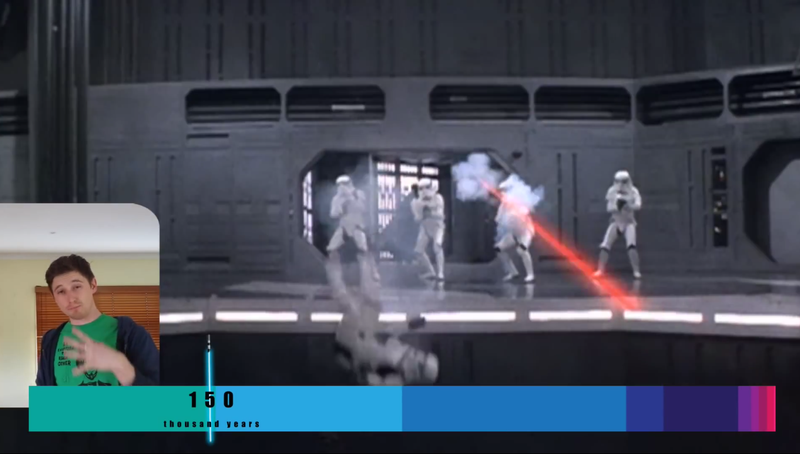 So, how about using Star Wars as a metaphor, calculating out what events happen when in the story? But, humans don't take up much time at all — the last second of the last episode doesn't give us much to work with. So, about halfway through the clip, Robin Ideas switches things up by offering an alternate timescale. Take scientific accuracy, add in an adorable accent and a lot of geek-enthusiasm, and coat it all in Star Wars, and the result is a video that deserves a lot more than 761 views.